Background and objectives Chronic kidney disease (CKD) is a significant public health problem whose diagnosis and staging relies upon GFR-estimating equations, including the new CKD-EPI equation. CKD-EPI demonstrated superior performance compared with the existing MDRD equation but has not been applied to a healthcare system. Design, setting, participants, & measurements We identified 53,759 patients with stages 3 to 5 CKD on the basis of either MDRD or CKD-EPI equations using two eGFR values <60 ml/min per 1.73 m2 >90 days apart from an outpatient setting. We compared patient characteristics, presence of related diagnosis codes, and time CKD classification between equations. Results The number of patients identified with CKD decreased 10% applying CKD-EPI versus MDRD. Changes varied substantially by patient characteristics including a 35% decrease among patients <60 years and a 10% increase among patients >90 years. Women, non-African Americans, nondiabetics, and obese patients were less likely to be classified on the basis of CKD-EPI. Time to CKD classification was significantly longer with CKD-EPI among younger patients. 14% of patients identified with CKD on the basis of either estimating equation also had a related ICD-9 diagnosis, ranging from 19% among patients <60 years to 7% among patients >90 years. Conclusions Consistent with findings in the general population, CKD-EPI resulted in substantial declines in equation-based CKD diagnoses in a large healthcare system. Further research is needed to determine whether widespread use of CKD-EPI with current guidelines could lead to delayed needed care among younger patients or excessive referrals among older patients. Chronic kidney disease (CKD) has emerged as a public health problem throughout the United States and developed countries worldwide (1–3). CKD may progress to advanced kidney failure and ESRD requiring dialysis and/or kidney transplantation but is also commonly associated with a host of comorbid medical complications and an increasing risk of cardiovascular disease (3–6). The Kidney Disease Outcomes Quality Initiative of the National Kidney Foundation has proposed a schema for earlier detection and staging of CKD that has been widely adopted (7). The GFR is considered the best index of kidney function in health and disease. Because GFR is not easily measured in clinical practice, it is often estimated from equations such as the Modification of Diet in Renal Disease (MDRD) equation, which incorporates serum creatinine, age, race, and gender (8). Diagnosis and staging of CKD relies on equations that determine the estimated GFR (eGFR). Importantly, the MDRD equations were developed by studying patients with CKD such that its major limitations are imprecision and underestimation of true GFR (bias) at higher renal function levels (9,10). More recently, the Chronic Kidney Disease Epidemiology Collaboration (CKD-EPI) equation was developed using data from ten studies and validated using pooled data from another 16 clinical studies (11). The new CKD-EPI equation was found to reduce bias compared with the MDRD equation, especially among patients with eGFR greater than 60 ml/min per 1.73 m2, although precision remained suboptimal. The investigators also reported decreased prevalence of CKD in the United States using the CKD-EPI equation as compared with the MDRD formula in the nationally representative National Health and Nutrition Examination Survey (NHANES) sample (11.5% versus 13.1%) (11). A similar decreased prevalence of CKD using CKD-EPI was also recently reported in the Australian population (12). However, the authors of the study reporting the CKD-EPI equation did note a limitation of their study sample as not representative in certain demographic groups including few participants older than 70, few with higher GFR, and limited participation of racial/ethnic minorities. A recent report indicated that the National Kidney Foundation has supported implementation of a GFR calculator using the new CKD-EPI equation, potentially suggesting both endorsement and widespread application of CKD-EPI (13). Cumulatively, the new CKD-EPI equation has been shown to improve estimation of GFR and decrease prevalence in the general U.S. population. However, the equation has not been applied to a large patient population within a healthcare system. As compared with the general population, patients within a healthcare system likely differ in both demographic characteristics and comorbid conditions and may often have increased encounters with providers. Because CKD is typically diagnosed within a healthcare setting, it is important to understand the effect of any diagnostic tool in this population. Our principal aims were to evaluate differences in the number and characteristics of patients with stages 3 to 5 CKD within our healthcare system using the CKD-EPI equation versus the MDRD equation to understand the potential implications of the new equation for clinical practice. As part of an effort to develop a chronic kidney disease registry, we identified adult patients (age ≥18 years) in our electronic medical record system that qualified for CKD stages 3 to 5 on the basis of two eGFR values <60 ml/min per 1.73 m2 more than 90 days apart using either the MDRD or CKD-EPI equations (9,11,14). Estimated GFRs were derived from laboratory samples obtained as part of outpatient clinic visits between January 1, 2005 and March 5, 2010. Patients who only had a listed ICD-9 diagnosis code indicative of kidney disease but did not meet eGFR criteria were not included in this study. All of the serum creatinine measurements for the study population were performed in the same clinical laboratory, which used integrated database management system-traceable samples to minimize calibration bias. As such, the MDRD equation applicable to integrated database management system-traceable samples was utilized throughout the study (9). Using the two GFR estimating equations, we compared the distribution of patient characteristics classified with CKD stages 3 to 5 in our healthcare system. We depicted changes in our population that would have been classified by both equations and then using each equation alone. We also compared the presence of ICD-9 diagnosis codes indicative of kidney disease in our electronic medical records on the basis of age and classification of CKD with each equation. We utilized Kaplan-Meier plots to describe time to classification of CKD utilizing each equation. These models were used to depict how rapidly patients would be classified with CKD on the basis of each equation including patients that were ultimately classified with CKD with both equations. The initial time at risk for CKD classification was defined as 90 days after the patients' first serum creatinine measurement, representing the first day at which patients could be classified with stage 3 to 5 CKD on the basis of the estimating equations. Models were censored at the time of death, ESRD onset, or last patient follow-up. We included variables available through our electronic medical records that are included in the estimating equations (gender, age, and race), those associated with eGFR that have been tested in prior studies (diabetes and body-mass index [BMI]), and primary health insurance, which potentially could reflect the number of encounters (and laboratory measures) within our healthcare system. Further description of the development of the registry and validation of comorbid conditions are described in a recent manuscript (14). All of these analyses were conducted utilizing SAS v 9.2. (Cary, NC). Between January 1, 2005, and March 2010, there were 516,022 patients with at least one outpatient serum creatinine in our healthcare system. Among these, 292,372 patients had at least two serum creatinine measurements, and 255,409 patients had two measurements at least 90 days apart. Of these, a total of 53,759 patients were classified with CKD 3 to 5 in our healthcare system on the basis of either the MDRD or the CKD-EPI equation. An additional 3877 patients were identified with CKD on the basis of ICD-9 codes alone (without meeting eGFR criteria), but these patients were not utilized for this study for the purpose of comparing equation-based diagnoses. The mean age of our CKD stage 3 to 5 population on the basis of either equation was 70 years (SD = 13). Twelve percent of patients were African American, 56% were female, 20% were diabetic, and the average BMI was 29 kg/m2 (SD = 6). Among patients with equation-based classification of CKD stages 3 to 5, 46,985 (87%) were classified with CKD on the basis of both MDRD and CKD-EPI, 5951 (11%) were classified only on the basis of MDRD, and 823 (2%) were classified only with the CKD-EPI equation (Table 1). Overall, the number of patients classified with CKD stages 3 to 5 decreased 10% with the CKD-EPI equation relative to MDRD. Among younger patients (<60 years), classification of CKD was significantly higher utilizing the MDRD equation (35% of patients classified only by MDRD, whereas no patients were classified by CKD-EPI alone). Among patients aged 60 to 69 and 70 to 79, there were 11% and 3% declines in CKD classification, respectively, on the basis of CKD-EPI. For patients over age 80, classification of CKD was progressively higher with use of the CKD-EPI equation including a 10% increase in CKD classification among patients over age 90. The age distributions of our population on the basis of use of the different equations are displayed in Figure 1. As depicted, the age of patients classified with CKD only on the basis of CKD-EPI was markedly older than patients classified with both equations or MDRD alone. Age distribution of stage 3 to 5 CKD population on the basis of estimating equations. (A) Population classified with CKD by both CKD-EPI and MDRD (n = 46,985). (B) Population classified with CKD only by MDRD (n = 5951). (C) Population classified with CKD only by CKD-EPI (n = 823). Classification of CKD increased among African Americans overall (+2%) as compared with a 11% decrease in non-African Americans. CKD classification decreased more among nondiabetics versus diabetics (11% versus 6%), women versus men (12% versus 7%), patients with higher BMI, patients without Medicare as primary insurance, and patients classified later in our study period. Figure 2A displays the time to CKD classification (on the basis of eGFR) by age group using the MDRD equation. There was relatively little variation in time to CKD classification among patients by age group over the study period. In contrast, the time to CKD classification decreased by age using the CKD-EPI equation in the same cohort of patients (Figure 2B). Time to classification was shortest among patients over age 90 and substantially longer among patients younger than 60. Time to CKD classification on the basis of MDRD was similar between men and women (20.3 months in men and 21.2 months in women to the 75th percentile). On the basis of the CKD-EPI equation, the time to CKD classification was longer in both gender groups relative to MDRD, and women had approximately 5 months longer time to the 75th percentile of patients classified with CKD as compared with men (29.1 months versus 24.2 months, respectively). African Americans and non-African Americans had similar times to CKD classification on the basis of MDRD (21.4 months versus 20.8 months, respectively, to the 75th percentile). Time to CKD classification was longer among non-African Americans using the CKD-EPI equation (19.9 months among African Americans and 28.0 months non-African Americans to the 75th percentile). 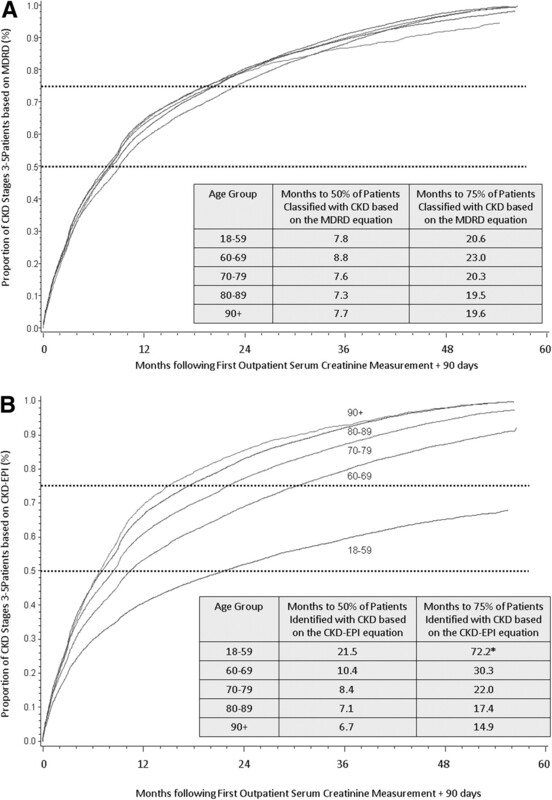 Among patients that were classified with CKD by both equations over the study period, younger patients (<60 years) were classified an average of 10.3 months sooner with MDRD versus CKD-EPI, and the oldest patient group (>90 years) was classified 2.1 months delayed with MDRD versus CKD-EPI. (A) Time to classification of CKD by age on the basis of the MDRD equation. (B) Time to classification of CKD by age on the basis of the CKD-EPI equation. *Extrapolated time assuming a Weibull survival distribution. The proportion of patients that had ICD-9 diagnosis codes indicative of kidney disease in our population is displayed in Table 2. The proportion of patients with at least one code was 13.8% including 11.7% (CKD), 2.6% (hypertensive nephrosclerosis), 0.3% (polycystic kidney disease), 0.6% (glomerulonephritis), and 2.6% (diabetic nephropathy). Younger patients were more likely to have diagnosis codes indicative of kidney disease including 19% of patients under age 60 as compared with 7% of patients over age 90. Among patients identified with CKD on the basis of the CKD-EPI equation but not MDRD, 2% (n = 17) of patients had an ICD-9 code indicative of kidney disease. Among patients identified with CKD on the basis of the MDRD equation but not CKD-EPI, 2% (n = 130) of patients had an ICD-9 code indicative of kidney disease. The median number of serum creatinine measurements utilized to estimate GFR in the population was 7 (quartile one = 4, quartile three = 13). The numbers varied mildly in the population: African Americans = 9, non-African Americans = 7; age <60 = 7, age 60 to 69 = 8, age 70 to 79 = 7, age 80 to 89 = 7, age 90+ = 5; diabetics = 9, nondiabetics = 7; Medicare as primary insurance = 7, Medicaid = 8, and other insurance = 7. Men and women both had median 7 measures over the study period. Among patients classified with CKD on the basis of the CKD-EPI equation, the average difference in eGFR at the time of classification was similar (0.05 ml/min per 1.73 m2 higher with MDRD): 2.4% of patients had eGFR values >5 ml/min per 1.73 m2 different from MDRD, and 3.8% of patients had ≥10% differences in eGFR compared with MDRD (Table 3). These differences again varied significantly by patient characteristics, and in particular differences were most prominent at the extremes of age. The primary finding of our study is that within a large healthcare system, the application of the CKD-EPI equation resulted in 10% fewer patients classified with stage 3 to 5 chronic kidney disease. The number of younger patients (<60 years) classified as CKD on the basis of estimated GFR was reduced by 35% with the CKD-EPI equation as compared with the MDRD equation. Time to CKD classification was substantially longer for younger patients using CKD-EPI as compared with MDRD. In contrast, among patients over the age of 80, CKD-EPI resulted in more rapid and increased CKD classification. Both African Americans and men were classified with CKD more rapidly with use of CKD-EPI compared with MDRD. Only a minority of CKD stage 3 to 5 patients also had applicable ICD-9 codes, but these codes were more common among younger patients in our cohort. Cumulatively, the results indicate that the reduced classification of CKD on the basis of the CKD-EPI equation in the general population is also consistent in a large healthcare system. However, the characteristics of patients classified by CKD-EPI, particularly age, are markedly different than those patients who are classified using the MDRD equation. CKD-EPI has been shown to improve accuracy and also to increase eGFR for the average individual. Therefore it is not unexpected that the changes in the general population were somewhat consistent in our healthcare system. However, patients within a healthcare system are not representative of the general population. As such, this study examined the effect of equation-based classification of CKD in a population that likely has increased comorbid conditions, is older, and has more interactions with healthcare providers. Our findings appear to indicate that the broad application of the CKD-EPI equation may result in a perceptible change in both the number and characteristics of CKD patients in healthcare systems, which may affect treatment planning and clinical decision making. This change may be accelerated by widespread implementation of calculators using the CKD-EPI equation for GFR reporting (15). The most notable effect of the CKD-EPI equation for CKD classification in our system appears to be at the extremes of age. It is worthy of note that estimates of the effect of CKD-EPI equation in the general population were based on the NHANES sample and limited to patients under 85 years because the NHANES sample truncates reported ages to protect the privacy of survey participants. Our study, which contains a substantial population of patients over 80 and 90 years of age, suggests that the effect of CKD-EPI may in fact be qualitatively different in the “older old” patient groups. In particular, as compared with their younger counterparts, patients over age 80 are more likely to be classified and more rapidly classified with CKD with the new equation. This was particularly notable for patients over the age of 90, in which 27% of patients had a more than 10% difference in eGFR at the time of classification, and the overall incidence of CKD classification increased 10%. Findings from our study may indicate an unappreciated effect of the new equation in the advanced age population, which might also be considered in the context of an aging U.S. population and known decline in GFR with age (16). Without the benefits of long-term follow-up, it is unclear from our study whether the differences in classification of CKD patients using CKD-EPI would result in any significant benefits or risks to patients. For instance, a potential ramification of the new equation, accompanied by the same standards for CKD classification, may be that younger patients are not identified with kidney dysfunction as rapidly, whereas early diagnosis of CKD may have important benefits to slow the progression of disease in these patients (15,17–19). Although in general, younger patients are more frequently diagnosed with CKD on the basis of proteinuria rather than eGFR, only a minority of patients in our study population had ICD-9 codes indicative of kidney disease (20). Important prospective questions will be to determine whether younger patients may benefit from early diagnosis that may be unrecognized or delayed with the new equation and how many patients (young and old) are actively managed on the basis of diagnoses and classification of CKD. On the other extreme, among patients of advanced age, we must also consider the ramifications of earlier and additional classification of CKD. In particular, among patients older than 90, we observed a 10% increase in CKD classification with CKD-EPI. Important follow-up studies are needed to assess whether more rapid classification of CKD among these patients will improve outcomes or whether the new equation could lead to increased referrals and resource utilization with limited effects on outcomes. Men and African Americans were also more likely and more rapidly classified on the basis of the CKD-EPI equation. In fact, prior concern existed for the high prevalent rates of CKD among the elderly, women, and Caucasians with the MDRD equation compared with the low incidence of ESRD in these groups. This dichotomy was postulated to exist because of competing risks for fatal cardiovascular disease in the elderly and/or faster progression of CKD in men and African Americans (21). These observations do not resolve whether the shift in demographics will necessarily translate to prolonged disease progression but do confirm a shift in our population to groups that have historically had greater ESRD rates. There also may be value in evaluating the prognostic utility of single eGFR levels (rather than current guidelines classifying patients with more than two measures more than 90 days apart) for identifying patients at potential risk within a healthcare system. Other efforts, such as those recently reported from the Centers for Disease Control on CKD surveillance, indicate that many of these important efforts are underway and may reveal the effect of the CKD-EPI equation on a broader scale (22). The primary limitations of this study relate to the identification of patients with CKD only through encounters with our healthcare system. This leads to a clear form of ascertainment bias because they would be extrapolated to a population outside of a healthcare system. We could not identify patients that had continued care or onset of CKD through other healthcare providers, which may have affected timing of equation-based classification. Furthermore, both of the CKD-EPI and MDRD equations used to estimate GFR of our patients are not indexed to measure iothalamate GFR as a gold standard, and as such we are not able to discern whether the GFR estimation in our population was improved with either equation. We did not have systematically documented measurements of albuminuria in our study to ascertain patients with stages 1 to 2 CKD. Finally, we did not have complete information for additional clinical outcomes that may have affected the number of provider encounters and potential for laboratory testing. The important implication of this study is that the newly developed CKD-EPI equation leads to decreased classification of CKD among patients that may be reasonable to extrapolate to similar healthcare systems. Our findings suggest that the CKD-EPI equation leads to marked differences in the characteristics of patients classified with CKD stages 3 to 5, most notably a significant shift away from classification of younger patients and more common and rapid classification of patients over age 80. Although some of the observed changes in classification may be due to subtle shifts in eGFR, they certainly may affect referral patterns and treatment. As such, these observations may be important considerations affecting clinical practice, patient care, public policy, and economics. Further studies validating our findings in other healthcare settings, examining the accuracy and applicability of GFR estimating equations in elderly populations, and determining the clinical implications of differential diagnosis and timing of CKD classification associated with the new equation are critically needed. The primary funding source for this study was an unrestricted grant to Departmental Research and Education fund from Amgen Pharmaceuticals. We would like to acknowledge the contribution of Ben Verone for his initial work on developing the registry. Portions of this manuscript were presented at the 2010 American Society of Nephrology conference; November 16 through 21; Denver, Colorado.